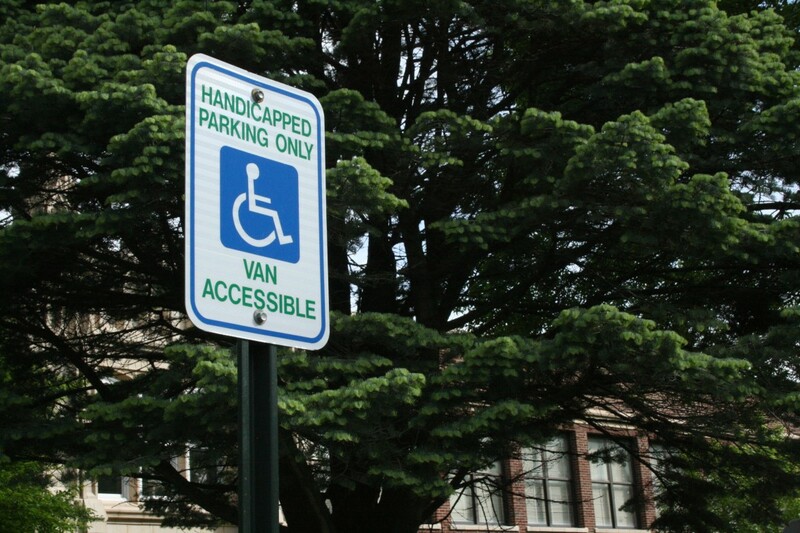 A sign for van-accessible handicapped parking is shown outside a Cedar Rapids school on May 12, 2016. In an IowaWatch review of Iowa school districts' annual equity reviews, the category with the most ADA non-compliance citations was parking, including passenger loading zones. The reviews are conducted by the Iowa Department of Education in a handful of districts each year. Since 2010, the Iowa Department of Education has inspected 48 school districts in the districts’ annual equity review, and all except one had areas of non-compliance with the ADA. The categories with the most areas of non-compliance are parking, including passenger loading zones, entrances and toilet rooms. Cael Rudkin, a soon-to-be freshman at West Marshall High School in State Center, uses an electric wheelchair and has had first-hand experience with schools not being ADA compliant. His elementary school did not have an elevator. While the school accommodated Cael by moving all of his classrooms to the first level, he still was not able to access all of the school as his able-bodied peers could. “One time, when I was littler, we were going upstairs to a different classroom and my aid was carrying me and he tripped and I kind of hit my head a little bit and I guess they probably should have had the elevator,” he said. The Waterloo Community School District was among the school districts that were not in compliance at the time of its equity review. The district took action to become compliant and has been in compliance for the past four years. Tara Thomas, director of school and community relations for the Waterloo school district, said that when the violations were brought forward, the district worked to address those issues and continues to create annual equity compliance plan to look at building accessibility and underrepresentation of student populations, including underrepresentation based on physical access. “Hundreds of hours and thousands of dollars are put toward our ADA compliance and they should be,” Thomas said.